On your marks, get set, go blue! Lace up because registration is now open for Mount Royal’s 3rd Annual Colour-U Blue Walk and Run. The any-pace race, from walking to running, is held in the spirit of kicking off the school year. Students are given blank white t-shirts before-hand and can choose their path from mild to extreme blue-ification. 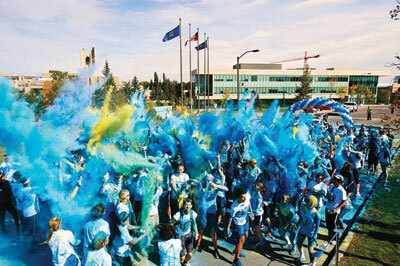 Colour-U Blue is back this year! Get ready to be ‘blueified’ (Photo from the 2013 run). Prizes, snacks and festivities will take place after the race. You’ll have a chance to win a $50 dollar Winners gift card for the best costume, with the Colour-U Blue logo still visible, and for the best tweet with photo from the race. Volunteers are needed in case you don’t want to take on the 4.5k race. You’ll get to throw paint at people running by, which sounds like a pretty good gig. For more information about volunteering email recevents@mtroyal.ca. Start the school year by hitting the ground running. Registration closes on Sept. 19. Registration is $15 dollars for students, $20 dollars for members of the MRU gym and $30 dollars for non-members. The paint is washable and non-toxic. For details about the race and for an information package with everything you need to know, visit mtroyal.ca/recreation.